Literally tucked away in a corner of an old suburban strip mall, Smash Kitchen’s large restaurant is unexpected. The dining area has a cozy recreational room feel, swathed in dark hunter green and browns. With a separated smaller room near the entrance, it’d be an ideal location for large groups and parties. It’s certainly a family friendly restaurant, but doesn’t look like one; during Friday evening, most tables appeared to be groups of friends. Their menu is a safe one, offering classic comfort food with a bistro twist. After a huge lunch, I stuck with the seafood salad ($19) for the evening. The spring mix base is pretty plain, simply topped with grape tomatoes and onion. What made the dish was the trio of seafood offerings: a meaty crab cake that incorporated decent old bay seasonings, cool cocktail shrimp and seared ahi tuna. 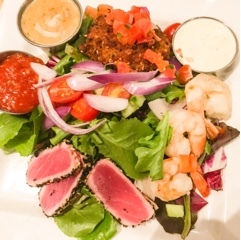 Neither were that amazing – the crab cake could have been warmer and the seared ahi tuna needed a more flavourful crust – but they were still satisfying. Plus, it’s a dish for people who love condiments, as each had their own including a honey dijon vinaigrette for the greens. 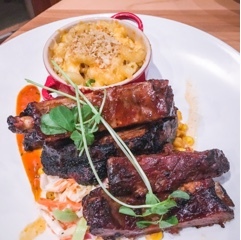 The stick-to-your-ribs entrées is where Chef Isaac Co’s passion obviously lies. 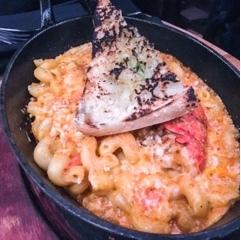 A brilliant idea to incorporate a rosé sauce base in the lobster mac ‘n’ cheese ($22) so there’s a bisque taste to the dish. I loved the scoobi doo pasta used within which is great for picking up the sauce and gratin cheese crust. Trying a piece of my friend’s ribs in the half rack and mac ($22), they were flavourful and had a nice smoky crust despite not touching a smoker. It’s certainly a hearty dish that’d make any Southerner happy, with a side of bacon laced mac 'n' cheese and roasted corn kernels with coleslaw on the bottom. Despite looking rather impressive, the crust on the buttermilk fried chicken ($19) was too hard, lacking the flaky crispiness I love. When the crust separates from the chicken, you realize it hasn’t been bound properly. 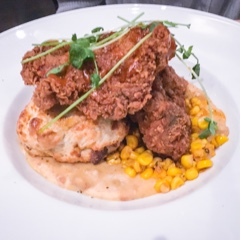 Yet, it offers good value and you’d surely be full after having the cheddar and bacon biscuit, chipotle lime corn, and sausage gravy that’s so thick it had a grits feeling to it. Smash Kitchen takes their time making the meals and is large enough that you don’t feel you’re in a rush to leave. It’s a great hidden gem amongst the suburban offerings, you’ll just need to find it.